Did I make a GSD Puppy socialization mistake??? So I recently got my first GSD from a breeder and couldn't be more thrilled with him. He's very healthy and happy, a big boy was 25lbs at 9 weeks when I brought him home. My situation is this... After bringing "Ben" home, I soon after began taking him on short car rides (he now enjoys calmly) and began taking him to places such as the video store, the petsmart (we use banfield there anyway) and even the gym!! He's got a beautiful temperament form what I can tell, if he is startled or unsure he takes his stance, evaluates and either barks, or decides to investigate further. However when I first took him in public, he was unsure about people edged away, so I allowed them to kneel to see if he would approach, he did and got loved on. I didn't want him to be fearful! He is now comfortable with all strangers, however he seems to want them to pet him, trying to go up to them or staring and wagging his tail. I do want an aloof Gsd who is tolerant of strangers petting but not seeking it. ( his mother was very much this way) Have I destroyed this idea?? Or is it ok? Now that ben is confident that people aren't scary, I politely ask them to ignore him in public especially when he approaches them and tries to jump up. He is my first, I'm used to lab mixes lol, it's like night and day! I'd really appreciate any advice or prior experiences from seasoned owners. You want your German Shepherd to be people friendly and that is exactly why you need to let him meet as many as he can that are dog friendly. He needs to learn to be confident about people - not wary or frightened of them - that can create a nervous or scared dog and you DO NOT want that. As far as the jumping and things like that I'd say try to refrain from letting the puppy do that to people but making friends just keeps building the pups confidence and you definitely want that. Better a too friendly dog than one who is afraid of people and bites someone some day out of fear. Best advice ever is to get you and the puppy into a dog training class as soon as possible. You have a little Einstein there - help him reach his maximum ability by getting him active in a training class - it is good for both mental and physical exercise. I am glad to see that you're taking your GSD puppy out and about with you - that's great. 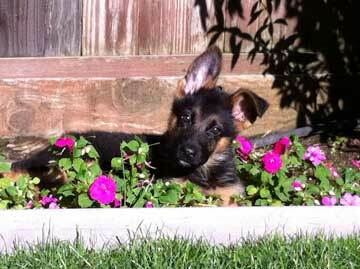 Keep it up even into adulthood and you'll have a great relationship with your German shepherd. The worth of socialization just can't be overstated.